There has been much speculation this week regarding the reasons behind Warren Buffett’s decision to hire Todd Combs to manage a portion of Berkshire Hathaway’s investment portfolio. Although short term stock price movements are meaningless, some observers have attributed Berkshire Hathaway’s stock performance over the past two days to investor discomfort with the selection, although it is equally plausible that investors are simply refocusing on their discomfort with the overall succession issue. Among Combs’s favorite stocks currently is Western Union, according to a letter Castle Point sent to investors on Oct. 19. The company is poised to expand its share of the global remittance market, and that should support strong cash flow, Combs explained in the letter. Western Union was an original member of the Dow Jones Transportation Average in 1884, he noted. 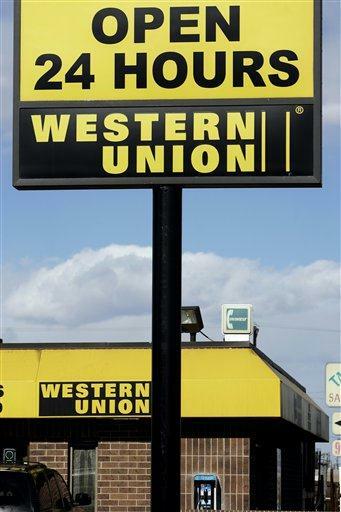 “One of its survivors, Western Union, has shown that it can endure the toughest of operating environments and preserve capital throughout economic cycles,” Combs wrote. Castle Point owned 1,224,000 shares of Western Union on June 30 and represented the fund’s fourth largest position. In this article, we will take a brief look at Western Union based on a quick review of the company’s latest 10-K report along with other recent filings. In the interests of brevity, we will focus on Western Union’s recent history as a company primarily occupied with money transfer and payment services. However, Western Union has a fascinating history dating back to the mid 19th century and a basic summary can be found on Wikipedia for those who are interested. Western Union was a subsidiary of First Data until it was spun off in early 2006. The company currently operates in three segments: Consumer to Consumer, Global Business Payments, and Other. We will focus on the two most important segments: Consumer-to-Consumer and Global Business Payments. The other segment is primarily comprised of Western Union’s money order business and accounted for less than two percent of total company revenues in 2009. Money transfers between two individuals is the most important business for Western Union and accounted for 84.6 percent of revenues in 2009. The vast majority of money transfers are cross-border transactions in which a customer in one country sends remittances to a recipient in another country. The business is heavily dependent on migrants who need to send funds to family members in their country of origin. As a result, transaction volumes can be sensitive to overall economic conditions in countries that have a high level of migrant workers. In 2009, the consumer-to-consumer segment processed $71 billion in principal transfers, of which $65 billion were cross-border transfers. The business earns fees both based on explicit charges associated with the principal being transferred as well as foreign exchange income derived from a spread between the exchange rate used in the transfer and the exchange rate that Western Union pays to obtain funds. We can see that the business has attractive operating margins in the high twenty percent range. The average principal transferred per transaction is relatively modest and consistent with the small remittances that migrant workers are likely to be able to send to relatives in their home countries. Over the past four years, we can see that total transaction fees as a percentage of total principal volume has fallen from 5.8 percent in 2006 to 4.5 percent in the first nine months of 2010. This is likely due to increased competition from other payment services. However, Western Union seems to be somewhat insulated from competition based on brand recognition and the fact that the company has a very large number of agents located in over 200 countries. While transaction fees as a percentage of total volume has fallen, the company’s various restructuring initiatives appear to have been sufficient to maintain operating margins. The global business payments segment provides several options for consumers to make payments to businesses such as utilities, auto finance companies, mortgage servicers, and government agencies. In September 2009, Western Union acquired Custom House which facilitates cross-border cross-currency services. One interesting service provided by the segment is the “Equity Accelerator” product which charges an up-front fee to customers who wish to schedule additional recurring principal payments on their mortgages, apparently targeting customers who do not have the discipline to simply make extra payments on their own. We can see that this segment also provides attractive operating income margins, although the acquisition of Custom House has somewhat depressed overall segment margins since the acquisition in late 2009. The increase in foreign exchange revenues is mostly accounted for by the Custom House business. High Debt Levels. The company had $3.3 billion in borrowings as of September 30, 2010 which accounted for 88 percent of total capitalization. Although the current profitability of Western Union can easily service the interest on this debt and the company’s credit rating should allow debt to be rolled over upon maturity, any potential erosion in the business over time could leave the company exposed. Competitive Landscape. Western Union’s consumer-to-consumer business model is built upon the ability to charge relatively high fees to consumers transferring small sums. The company’s broad distribution network and brand name provides a significant amount of protection (the “moat”) but as customers become more comfortable with electronic payment options, competition from services such as PayPal or Xoom could begin to take share. Increased Technological Sophistication of Customer Base. As more customers in developing countries obtain cellular phones with increasingly sophisticated capabilities, the need for physical agency locations may somewhat diminish. Smart phones and electronic payment options could allow customers to use services such as PayPal to realize substantial cost savings. For example, typical PayPal fees for international transfers are in the 4 percent range. Western Union fees vary but can be substantial especially for very small transfers. For example, the company has run “$50 for $5” promotions in which customers can transfer up to $50 for a flat $5 fee, and this is apparently a discounted rate compared to normal fees. Dependency on Immigration. The company’s customer base is heavily dependent on immigrants who work in developed countries and send funds to family members in their home countries. There has been negative publicity surrounding some of the company’s operations and the company recently paid $71 million to the state of Arizona to settle a lawsuit related to its business practices. The political climate in the United States and in many parts of Western Europe has become increasingly critical of immigration. Major curtailment of immigration in general could adversely impact Western Union’s business. Brand May Not Fully Protect Moat. Western Union’s brand name is synonymous with safety. Customers know that funds sent to their relatives will arrive safely. They are willing to pay relatively steep fees to ensure the safety of their money. However, it is unlikely that customers necessarily have the same emotional attachment to Western Union that they may have to brands such as Johnson & Johnson or Coca Cola. In other words, if services of equal perceived safety are available at a lower cost, few emotional ties are likely to keep customers loyal to Western Union. We began the article by asking why Todd Combs is bullish on Western Union. Clearly, the business has proven that it has a significant moat based on the margins that have been achieved historically and there appears to be no reason to think that this moat will erode in the very near future. Based on company filings and conference calls, management is well aware of competitive threats and is seeking to put in place services that should compete with PayPal and other electronic payment services. 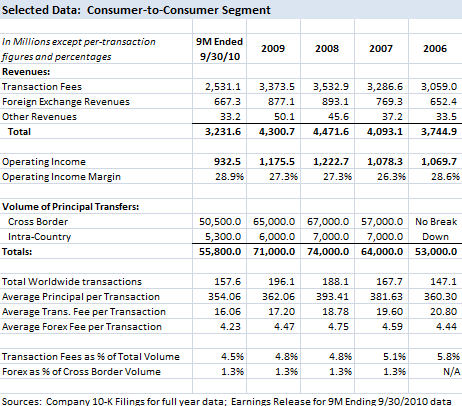 Western Union resembles a “toll bridge” and fits many of the criteria that Warren Buffett likes to see in a business. The company has strong cash flows and is easily able to operate with minimal levels of capital. At a recent stock price of around $18 per share, the valuation isn’t particularly high given projected 2010 earnings of $1.30 to $1.40 per share. However, the business is not without risk and there appears to be a reasonable possibility that the moat may be eroded to some degree in the future which could lead to margin pressure. It is not difficult to see why a value investor following Warren Buffett’s investment approach would like Western Union shares, although one would have to be convinced that the risk factors are not severe enough to significantly pressure margins going forward. Our brief review of Western Union has not provided the level of confidence required to own shares at the current price, although further study of the severity of the risk factors and the company’s strategy could very well lead to a more favorable conclusion. Disclosure: The author of this article does not own shares of Western Union. The author owns shares of Berkshire Hathaway. How Should Investors Assess Worst Case Scenarios in Japan? WU has not provided $1 of value for every dollar retained for shareholders and I do not forsee that happening in this business environment for some time to come. It would be difficult to argue WU is a low hurtle investment or a great business at a reasonable price.